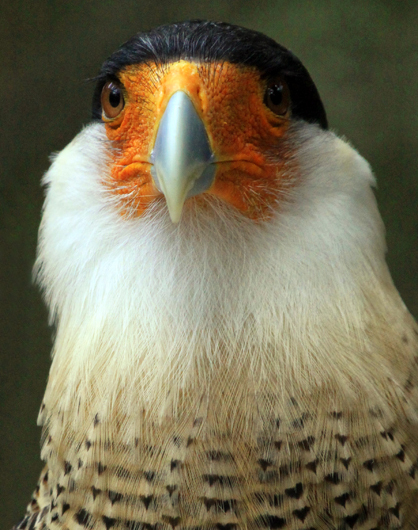 The Northern Crested Caracara is a member of the Falcon family, but unlike the Falco falcons in the same family, the Caracaras are not fast-flying aerial hunters, but are rather sluggish and often scavengers. An unusual looking bird, the top head feathers are black and tighly coiffed (ala Fonzie) and it has white feathers coming out and down from its bright orange face that looks like the beard of an old Amish gentlemen. I thought the unusual combination made for a striking portrait.